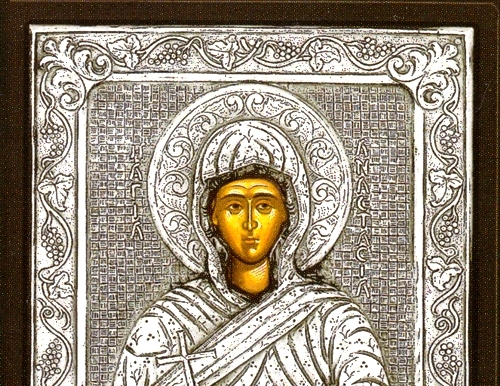 An exquisite silver Greek Orthodox icon of St. Anastasia the Healer. Saint Anastasia was a saint and martyr. She is venerated as St. Anastasia the Pharmakolytria, i.e. "Deliverer from Potions" or "Healer". There is little reliably known, save that she died in the persecutions of Diocletian. Most stories about her date from several centuries after her death and make her a Roman or Sirmian native. Anastasia has long been venerated as a healer and exorcist. Her relics lie in the Cathedral of St. Anastasia in Zadar, Croatia.